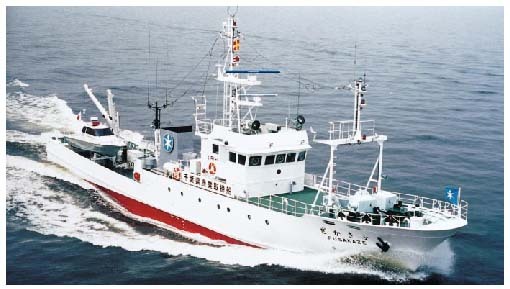 The 145-gt fishery patrol ship FUSAKAZE was delivered to Chiba Prefecture by Chiba Works of Mitsui Engineering & Shipbuilding Co., Ltd. in August 1998. 1. Improved stability, seaworthiness The ship is designed to lower the vertical center of gravity by adopting aluminum alloy for bridge and funnel construction. (1)　Installation of one set of 2,000 PS medium speed diesel engine. (2)　Adoption of bulbous bow at bow and cruiser stern hull form at stern. (1)　Adoption of electrically controlled clutch slip mechanism for reduction gear of main engine. (2)　Adoption of a powerful bow thruster and schilling rudder. 4. Strengthening of patrol function at night. (1)　Installation of infrared Ray Camera Sea Searcher with stabilizer. (2)　Installation of two sets of powerful searchlights remotely controlled from the bridge. 5. Highly effective patrolling operation in shallow-water areas. (1)　Installation of the following motor boat with small type radar, GPS and DSB wireless telephone. And Y type davit is provided. (1)　Installation of a Total Navigation System including navigating information display device with electrical chart, two sets of multi functional radar and underwater information device measuring depth, current and temperature. (2)　Provision of a total system for GMDSS (Global Maritime Distress and Safety System, A2 area) and better communication system. (1)　Reduction of noise and vibration of main engine and generators. (2)　Adoption of skewed propeller to minimize cavitation. (3)　Adoption of low-noise ventilation fans. (1)　Remote control system and automatic logging system for main engine and bow thruster at the bridge. (2)　Adoption of fresh water central cooling system for main engine, generating engines, air compressor and air conditioning units.